▸ How long does this service last? Once you, and possibly other family members have been added to our list, you will be delivered meals for 12 weeks. Remember meals are delivered every other Wed. Our Client Care Coordinator will notify you in advance of your service completion period. Meals are free of charge, however if you are able to donate, donations are very appreciated and allow us to be able to serve others in need. ▸ What kind of food is served? We cook with as many organic ingredients as possible and focus on nutrient-rich, plant-based ingredients. Emphasis is placed on using cruciferous vegetables, sea vegetables, homemade healing broths are used in our soups, and seasonal fruits are often used as dessert. ▸ How does delivery work? Meals are delivered to your door every other Wednesday typically between 3:00-5:00. If you know you are not going to be home when your driver arrives, please plan on leaving a cooler with ice packs inside so that meals can be kept cold and stored properly. ▸ How do I know if I qualify for Culinary Angels delivery? If you are going through a serious health challenge, or are the caregiver for someone who is, you qualify for our healing meals. ▸ How do I contact Culinary Angels to get signed up or make a change to my delivery? ▸ What types of meals are served? We deliver an entrée, and two side dishes, a healing soup, a healthy dessert, and a quart of bone broth upon request. ▸ How can I contribute? 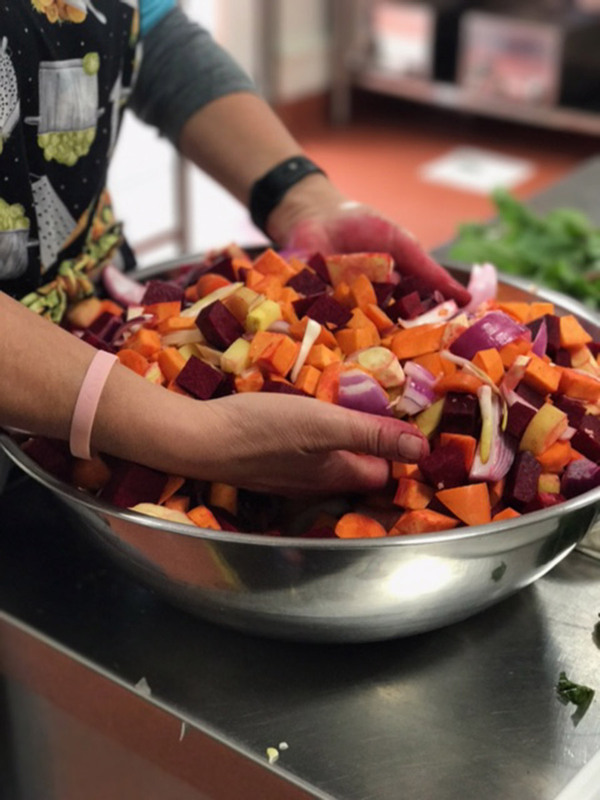 Culinary Angels accepts donations through our website or by check made out to First Presbyterian Church Livermore, with Culinary Angels written in the memo line. ▸ Where are the meals prepared and by whom? Meals are prepared in the beautiful kitchen at First Presbyterian Church in Livermore. All volunteers have successfully completed the California Food Handler’s Course and are trained by Culinary Angels.